Rob Howley says Wales' coaching set-up was compromised when he and Warren Gatland shared the job in the autumn. 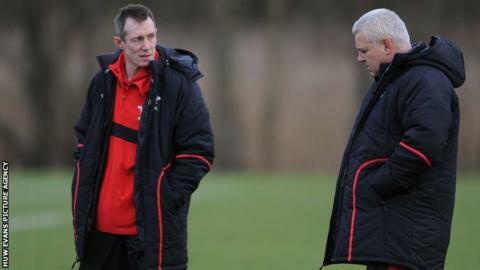 Wales' interim coach is at the helm for the Six Nations, while Gatland is on British and Irish Lions duty ahead of the summer of 2013 tour to Australia. Howley coached Wales for the two opening defeats by Argentina and Samoa, while Gatland was in charge as they lost to New Zealand and Australia. "We got on with it to the best we could," said Howley. "It was not the ideal circumstance and that was the way it was." After seeing Wales lose to the Pumas and the Islanders, Howley stepped aside as Gatland completed his scheduled return to Wales duties. Howley is now in charge for the whole of the 2013 Six Nations campaign before joining Gatland as an assistant down under and believes the lack of coaching continuity during the autumn had an impact on Wales' performance. Wales' four autumn defeats contributed to a seven-match losing streak, the worst run of defeats since they lost eight games in 2004/05. "I think we could have probably compromised all the coaches in terms of losing a coach of Warren Gatland's calibre and experience," said Howley. "And then regarding the two weeks on and two weeks off, I think the clarity we have going into the Six Nations is now there." Gatland was appointed head coach for the Lions back in September 2012 and he was expected to relinquish his role with Wales and not be available for their Grand Slam defence. But he reached an agreement with the Lions that allowed him to coach Wales in their final two autumn internationals against the All Blacks and the Wallabies. Howley has also drafted in Scarlets skills coach Mark Jones (backs) to join Shaun Edwards (defence), Neil Jenkins (skills) and Robin McBryde (forwards) in his backroom team for the tournament. Jones, 33, will return to the Scarlets after the Six Nations, but will be part of Wales' coaching team for the two-Test summer tour of Japan. McBryde will take charge for the tour to Japan, with Edwards, Jenkins and Jones as his backroom team. After the Lions tour Gatland is scheduled to return to the Wales role after signing a contract with the Welsh Rugby Union to the 2015 Rugby World Cup in England. Wales kick off the defence of their 2012 Grand Slam with the visit of Ireland to the Millennium Stadium on Saturday, 2 February.